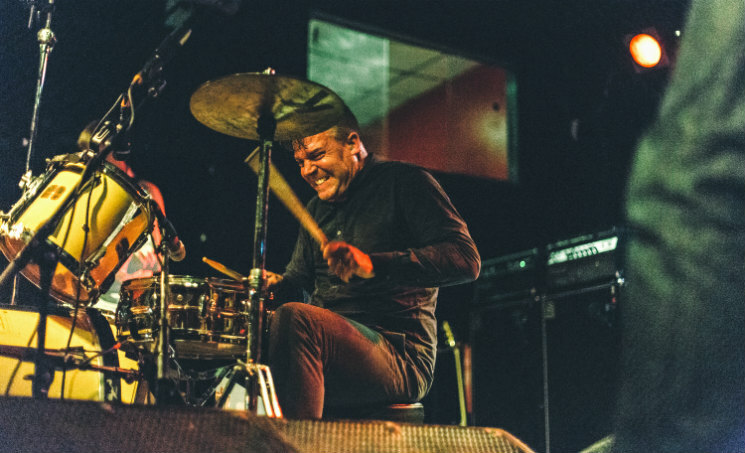 Experimental post-rock power trio Battles played a host of songs from their most recent album, La Di Da Di, as well as a few from their previous two to an adoring, jam-packed crowd on Thursday night (October 1). Even before the band hit the stage, the audience were already enraptured, with gear geeks taking note of Ian Williams' keyboard setup (an Ableton Push, iPad mini and a Novation 61 SL MkII, for all you near-sighted nerds out there), front row concertgoers capturing selfies in front of John Stanier's yellow drum set and cheering once his cymbal was raised by a stagehand as high as it could go (a distinguishing part of his setup). By the time guitarist Dave Konopka took his place and began constructing the arpeggiated loops and staccato plucks that make up the opening of "Dot Com," the crowd was ready to go off (well, as much as art rock-loving 30-somethings are, which means there was a lot of exaggerated head bobbing going on). From there, Williams showed off the full depth of his setup by building the skronky guitar shuffle of Gloss Drop cut "Ice Cream" from scratch (although, as with most acts that rely heavily on samples, it would have probably had even more of an impact if they weren't playing along to a backing track of Matias Aguayo's original vocal work) and delivered a bass synth-heavy rendition of "FF Bada" to one of the best responses to new material heard that night. By the time the band launched into the haunting sounds of "Futura," Stanier's back was so wet from sweat that it looked as if his midnight blue button-up had been replaced by a black leather jacket. Such is the case with any drummer who drums as hard as he does, but tonight was especially sticky due to the heat emanating from the near-capacity crowd. Watching Williams try to time drops of sweat away from his electronics was entertaining, especially during the aptly titled "Summer Simmer," but it was hard not to notice a few flubs as the band and attendance alike entered a delirious state. Stanier kept his cool during his drum-heavy interlude in "Tyne Wear," but by the time album follow-up "Tricentennial" hit, it seemed like Konopka and Williams were having trouble matching each others' complementary riffs. As the band began creating the intricate percussive elements of "Atlas," pockets of Lee's Palace started responding enthusiastically with each nuanced addition. Sadly, something was amiss from the get go, and by the time a sample containing children singing the song's hook was added to the mix, the band was way off tempo and struggled to get their footing. They found their stride near the song's latter half, but the band looked visibly frustrated as they exited the stage for a brief break. All would be forgotten when the band finally returned for a one-song encore. On record, La Di Da Di's "The Yabba" sounds like a culmination of all things Battles, emphasizing each member's distinct role in the group and penchant for experimentation. Rarely do songs sound better in-person, but this was the night's exception. It was a sight to behold live, with Williams fret-tapping and striking his keys in unison while human drum machine Stanier backed the pair up with a flurry of break beats and hi-hat hits. The set couldn't have ended on a higher note, and although there were a few missteps along the way, Battles proved once again that they're in their element live.